I recently had chicken pox, I'd like to share about how to remove chicken pox mark in this blog. Initially there was swollen like a pimple on the head, which if solved out of water, unlike acne which if broken out fat and a little pus. At first I thought because the shampoo and hair tonic. I change shampoos and hair tonic but no effect. After a week I started to get cold, followed with fever. I went to see the doctor and I was given a common cold medicine. Two days after that, it began to appear reddish covered almost entire of my face. Also some swelling like a mosquito bite in the face. I returned to see the doctor, and positively affected by chicken pox. Doctor immediately replace the flu drug into chicken pox drug. If only I told the doctor about the swollen like a pimple on the hair-covered head, surely doctor would immediately prescribe chicken pox at the first meeting. Unfortunately my hair is still thick enough so the doctor did not see. Doctor recommended a warm bath and using antiseptic soap. Do not scratch if itchy and use talcum powder to relieve itching. A week later I was feeling healthy again, but chicken pox left blackish brown flex in the face and body. I counted at least fifty black flex diameter of 5 mm on my face. It was very annoying, lucky that I am not a girl / woman. I was looking for references on the internet on how to remove chicken pox marks.There is a suggested eating lots of fruit wine, drink great morinda juice, etc. I also got a suggestion to use a mask of green beans, yam, cucumber, lime. 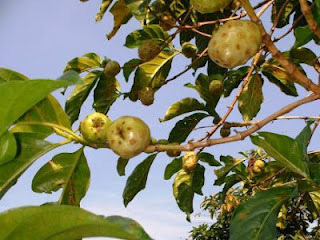 Finally I chose to eat raw leaves of great morinda (Morinda citrifolia), as I have a morinda tree in front of the house. 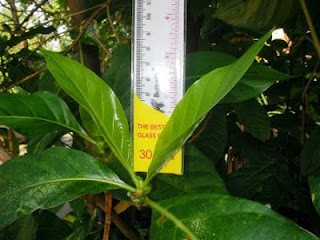 I picked morinda leaf size about 10 cm length, if too little is less fibrous, if too large it is difficult to digest and bitter. I ate raw morinda leaf almost every day about 10 leaves. At night I rub a thin slice of cucumber over the face, after about an hour then washed before bed to clean the rest of the cucumber. Eating cucumber also help. 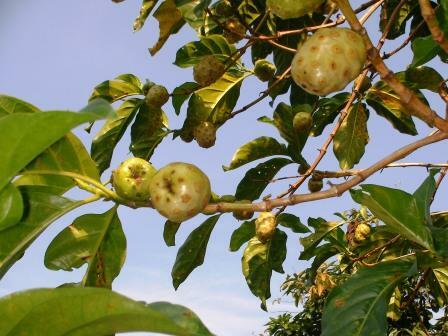 Shown above is morinda tree with plenty fruits. Shown below are morinda leaves with 5-10 cm long which I ate raw. About two months later, chicken pox marks were almost entirely vanished from the face, just saw some little black flex diameter 1 mm. I am continue eating raw mornida leaf because of its known to strengthen immune system, lowering uric acid, and lower the tension. I continue to rub cucumber slices to my face, and my head because it can prevent hair loss. I had tried to rub lime to my face, and it feels fresh. But the face so dry, and hard to remove blackheads. I dab of honey to moisturize the face again. So lime only suitable for oily face.